Imagine the strange paradox of a science fiction film about a UFO that "suppresses hysteria and defuses paranoia" and one that-- as author Peter Biskind continued in Seeing Is Believing: How Hollywood Taught Us to Stop Worrying & Love the Fifties-- produced a depiction wherein "Earth, not the alien culture, is dystopian," (156-157). Seems tough to imagine, doesn't it? Well, like many of the allegorical genre films of the 1950s which dealt covertly with issues of conformity (12 Angry Men), teenage homosexuality (Rebel Without a Cause), the McCarthy era (High Noon) just to name a few, director Robert Wise's compelling science fiction classic, which was just listed this year as the fifth best film in the genre by the American Film Institute also had a subtextual message that went beyond the work serving as mere surface level entertainment. Although it's been preserved as a "National Treasure" since 1995, originally, the film was based on the short fictional piece "Farewell to the Master" by Astounding Stories magazine writer Harry Bates. Adapted by anti-war, left-wing, Christian screenwriter Edmund H. North (Patton), director Robert Wise's film seemed to argue that "Earth (including the U.S.A.), far from being the last word in civilization, as centrists thought it was, exists in a state of virtual barbarism," (Biskind, 157). Much like Steven Spielberg's Close Encounters of the Third Kind and E.T., the film's presentation of alien life isn't the monstrosities served up in Independence Day, but in this film, it arrives in the form of Klaatu, played by actor Michael Rennie. "Surely the best behaved, most polite alien who ever hopped across hyperspace," as Biskind noted (151), Rennie's Klaatu arrives shortly into the film after his large flying saucer lands right in the heart of Washington D.C.'s mall. With the army drawing down on the saucer for two hours as nothing emerges, finally, instead of a three-eyed monster or blue martian (or "gray" rather as it was shot in black and white), we meet a handsome, well-spoken, and innocuous looking human with pleasing American diction whose opening line to the masses is that, "we have come to visit you in peace and with goodwill." Of course, with that many eyes focused on the alien with adrenaline charged, itchy trigger fingers, somebody fires directly at Klaatu, and that's when we first set eyes on Gort, his nine foot metal encased "bodyguard" and fellow alien who disintegrates tanks and guns with a laser that emits from a small slit in his facial shield (take that Iron Man). Explaining that instead of a weapon, Klaatu had been hoping to deliver a gift to the American president in order to study life on other planets-- which is now decidedly moot given the gunfire-- he's later moved to Walter Reed Hospital as Gort retreats to the ship to wait. Turning down an attempt to speak directly to the president alone, Klaatu's mission soon reveals itself as he says that he doesn't have time for the "petty squabbles of countries" and "childish jealousies" facing the globe in that era and needs to "explain [his peaceful message] to all the nations at the same time." Having traveled two hundred fifty million miles from a neighboring planet over the course of five months-- despite his patient demeanor, Klaatu isn't one to settle for any political posturing. So, finally he checks himself out of the hospital and-- assimilating with the general public-- dons the decade's traditional "gray flannel suit" styled attire, dubbing himself Carpenter, and renting a room under the same roof as the widowed Mrs. Benson (Patricia Neal) and her inquisitive son Bobby. While hysteria floods the headlines of the local newspapers and radio announcements, "Mr. Carpenter" continues on his quest, with young Bobby as his guide as he searches for the wisest person he can find. While it takes a good fifty-six minutes for us to step inside that famous flying saucer and Patricia Neal's unrealistic, overly neglectful single mother seems a bit too blase about handing her son off to a total stranger when there's "alien activity" about-- the film feels as Leonard Maltin noted "more timely than ever" (although last time I checked grammar it should be "timelier"). This is especially true given its important message of looking past country-lines to becoming united as a whole. Featuring an exceptional and noteworthy score by frequent Hitchcock composer Bernard Herrmann (which makes excellent use of the genre's fondness for theremins, organs, and strange hums and whirs), the third act of this unusual and intelligent film feels nearly as though we're watching a silent movie as the score takes center stage and Gort becomes our dialogue-free guide. While Klaatu's eventual resurrection once again and memorable message of peace (to warn against the end of the human race) has definitely left some to correctly interpret the film as subtly Christian, intriguingly, producer Julian Blaustein noted that the Christian angle from North was never discussed with the director or producer in the hopes that it would remain subliminal. However, when censors disagreed with Klaatu's ability to have "unlimited power over life and death," to appease the MPAA, a line was inserted that ultimately "the power of resurrection is reserved to the Almighty Spirit." And while some have chosen to read into the parallels on that level, more than anything it's a remarkable allegorical left wing look at the troubles facing society after World War II. By giving audiences an alien whom we can relate to-- much like E.T. whose departure also makes us sad and promotes friendship and peace-- the film, which Biskind additionally argued seemed to project a "technological utopia" went against the grain of what was popular for its time. Morally, in 1951, he noted that the film's "worst crime was not taking sides... lumping the United States together with the Soviet Union in its indictment of world politics. When Klaatu refused to meet alone with the American president, it was tantamount to treason," (pg. 158). While indeed reaction was mixed back in its initial release and aside from some second unit background material, the entire work was filmed on the sound-stages and back-lot of 20th Century Fox as its stars never set foot in the nation's capitol, in one of the DVD commentary tracks as filmmaker Wise speaks with director Nicholas Meyer, he said that the film's main priority was in sharing their stance "against armed conflict in the real world." Furthermore, according to Wise and Blaustein, their intention was "to promote a strong United Nations." 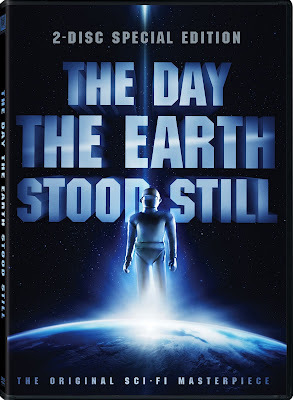 Releasing just in time for next week's hotly anticipated remake starring Keanu Reeves and Jennifer Connelly, which gets audiences psyched with a gripping seven minute sneak preview which precedes the film on disc 1, The Day the Earth Stood Still flies onto shelves in two-disc special editions for both DVD and Blu-ray owners. Adding to the previous extras available in its past DVD release, viewers have the option of listening to the film in its original mono track (in English, Spanish, or French), English 5.1 Dolby Surround, or via one of two feature commentaries including one with Wise and Meyer and another with film historians along with an isolated score track to view it just with Herrmann's memorable soundtrack. The second disc is divided into two fan-friendly menus of featurettes and galleries with the option to browse (via your remote) interactive pressbooks, extensive making-of and production photographs, as well as the film's entire shooting script from FADE IN to THE END. On the featurette menu, there's a number of relatively short bonus documentaries including a brief teasing look at the "History of Flying Saucers" in six minutes, biographical profiles on short story author Harry Bates and the screenwriter Edmond North, a documentary short film, as well as a fascinating look at "Science Fiction as Metaphor" in a sixteen minute intriguing extra that puts the film into perspective with the communist scare, Korean war, spy fears, nuclear worries, and all of the other issues terrifying citizens during the '50s. Honestly, it's one of the few classic science fiction works from that era that has remarkably lost none of its power and once again seems to be just as important as it was then. And while I can't speak for the new version of Earth-- for the genre at its finest and for some wonderful post-film discussion and food for thought, there's no beating Rennie's Klaatu in Robert Wise's brilliant original movie that Still stands above the rest.